Soups on! Bead Soup that is, courtesy of our fabulous hostess, Lori Anderson who organizes the entire show, pairing beaders from around the world to see what they come up with. Wondering just how big the Bead Soup party is? Check out this map that Lori put together. My partner this time around is the wonderful Tracey Nanstad of A Beadiful Mess. For a peak at the soup mix she sent, check out my earlier post. Her Lucky Robin Bluebird pendant really gave me the fits, trying to figure out what to do with it. The bail was too prominent (and pretty) to remove, so I couldn't just bead bezel around it like a cabochon. But it was too narrow to fit any of the various beaded ropes I came up with. So I finally broke down and pulled out my favorite book on wirework and sat down with my wire-snips and pliers. While my wireworking is fairly simple, I don't do it often. It's outside of my comfort zone, which is supposed to be part and parcel of this challenge. Yeah. I had fun figuring out how to wire the flower beads onto the metal knots. I used Tracey's pendant, clasp and silver circles. Searching through my stash for coordinating beads, I came across the pressed blue beads, leftovers from Kalmbach's bead soup party last fall. The red beads are garnets - I started to worry that I wouldn't have enough because less than half of them fit onto my wire. While I wrestled with what to do with the Robin Bluebird pendant, I noticed that the stone cabochon Tracey sent was perfectly shaped for a fish body. If you've been following my blog at all lately, you know I'm working with a fish theme this year. I thought about making a grand daddy of a Fancy Fish. Instead, I decided to draw a cartoony-style fish with beads. As I worked, it occurred to me that the way I planned for it to hang, people would only ever see one side of the fish at a time. So I decided to create a split personality fish, with a different look on either side. So it's like having two pendants in one. I made sure that the necklace worked worn either direction as well. "Fresh Catch of the Day"
The fish hangs from a felted, beaded bead 'float' that I made. For the supporting necklace, I wanted to carry on the ocean theme, without becoming too busy, especially since the necklace is quite long. I stitched a couple of my standard fish bodies, but decided not to add any other identifying details other than a little bead fringe to hint at tails. For the clasp, I used one of Tracey's textured copper discs, then made a 'fish hook' closure. 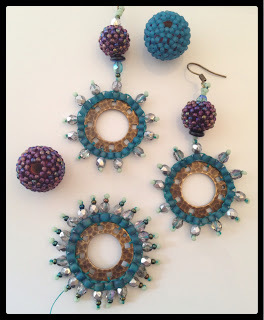 While figuring out the components for my Fresh Catch of the Day, I also stitched a couple of beaded beads and used brick stitch to create several medallions. By skipping every other bead when adding the fire-polished beads around the outer edge, I came up with a design that reminded me of a ship's helm wheel. But they never did quite fit into the design. I turned two of them into a pair of earrings for now. All three are likely to get used in something else in the future. So that's what I came up with working from Tracey's Bead Soup. Now it's time to see what Tracey made with mine. And to check out what everyone else has made as well. 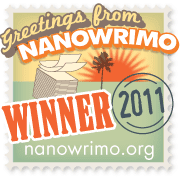 Lori has a complete list of participants on her blog. Crushing on the fish...a whole lotta awesomeness and my favorite by far! 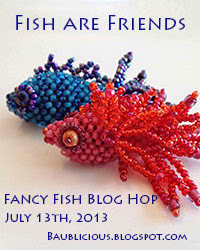 Love, love, love your fancy fish necklace! 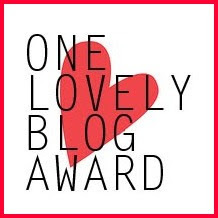 :0) What a beautiful idea! Yea, more fish. They are so much fun. Well done. Birs and fish and nautical theme :-) fantastic soup! your fish pendant is amazing, I love the split personality of it. I love what you did with the robin - it is perfectly proportioned, and everything just "works" - nice! And your fishy is fantastic! 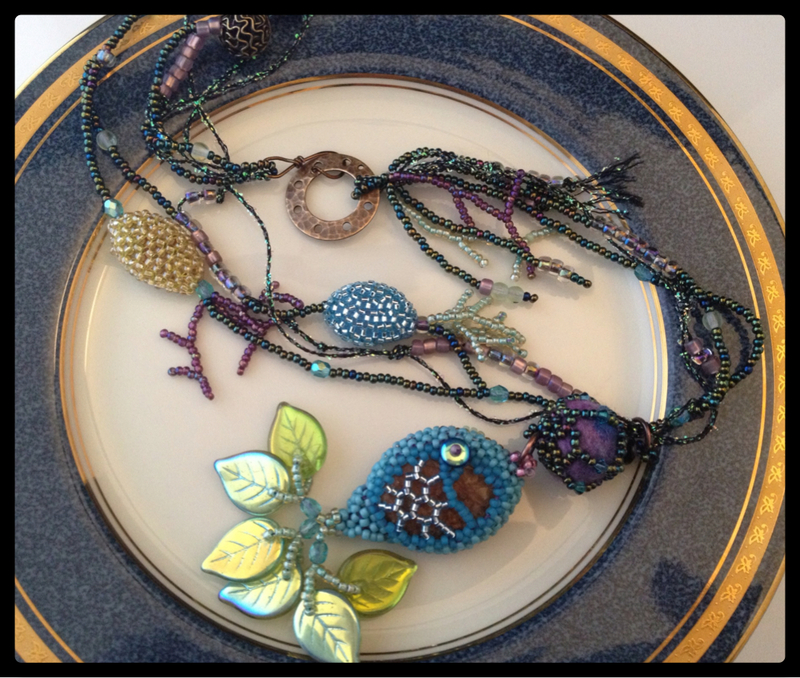 Both of your pieces are awesome - though that split personality fish necklace is to die for! Love, love, love the fish necklace! Super cute designs, I love your beaded beads! All your pieces are great. Really love the fish and the story of its creation! Love what you've done with your ingredients. And the beady fish is just adorable with it's leafy tail! "Fresh Catch of the Day" is a piece of art, exquisite! I LOVE, LOVE, LOVE that fish !!!!! WOW, so love everything you did, and am totally in love with your fish necklace! Love the fishy of course, love the robin piece and the way everything balances. I'm sure the medallions wil be part of another amazing piece in time. Love the fish necklace. It's sooo cool. I'm in love with that fish!!! I love that he's got two personalities. And a sequin for an eye, if I'm not mistaken! His eye on the blue side is a disc bead, but you're right - it does look like a sequin, especially in the photo. And it could have been a sequin. The fish pendants are stunning, so under the sea, what a great job. All your pieces are beautiful, great design. I was in love with the cheery little bird, but that charming fish is simply adorable. Another participant used leaves to create a flower. You used them to make a tail! Above and away the most creative piece I've seen so far. Thank you Ginger! 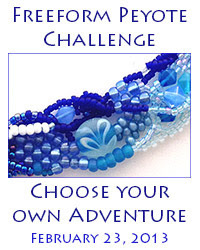 I enjoy using shaped beads in surprising ways, when the inspiration strikes. 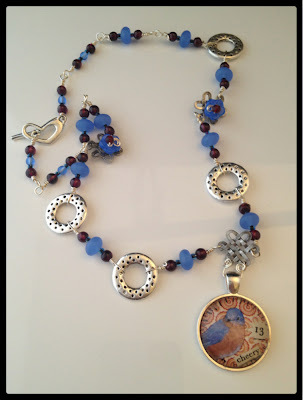 Wow Karen -- I really like what you did with the cheery little bird necklace....the blue beads are really make this little cutie tweet!! And the fish pendant is simply spectacular. Your designs are always amazing. Brava! Thank you! The colors were largely a response to the wonderful soup mix Tracey sent. I spent quite a while trying to color match and coordinate with some really interesting light green square beads she sent. In the end though, the inspiration beads didn't actually go into the necklace. All pieces are great but the fish necklace is so original!!! Your really brought out the details in Tracey's pendant by adding the blue pressed beads and garnets. And your fish necklace! 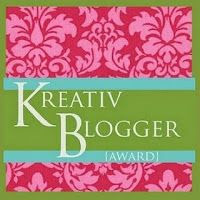 Gorgeous colors - fun, fun, fun design - fantastic focal! Thank you! And I am so impressed that you've already made it through the full list. I am still very definitely hopping, will be for the next few evenings. I love the necklace with the fish. simply gorgeous. I love the fish necklace, so cute! very original. So adorable. I love your pieces. Karen you did a remarkable job with the soups I sent. Have to tell you the pendant is a bluebird, not a robin! I love.that fish you made. How clever to do a split personality fish! Your designs are so unique and original. Very well done. Thanks for being such a wonderful partner. Eep! I 'thought' it was a bluebird, but then I started doubting myself because I didn't think bluebirds had red breast feathers (and I've never actually seen one in person!). Guess I'll have to pop into my post and correct that! I am so glad you were pleased with my creations! Well, just about the most creative reveal I've seen so far. I love it. That fish is fantastic and I love that Robin/Bluebird Pendant. Those blues and silvers has been a common color combination this reveal and I love it. And, hey, split personalities are good - keeps things from getting too boring. Great job! I love, love, love the fish!!!! You are so creative! Wow! Love your Fresh Catch of the Day necklace!! Very unique. Beautiful designs! Your fish necklace is so creative. I love it! 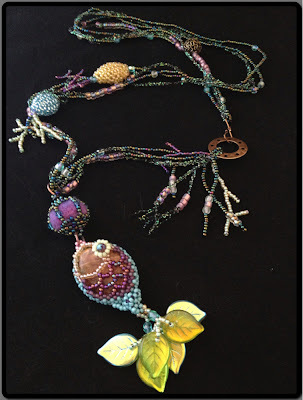 Love that you broke out your wireworking mojo on the first necklace, but the dual-personality fishie swimming admist the sealife just captured my heart! The wheels are very cool, too, but I understand why you kept them on their own instead of putting them with Mr. Fish. LOVE! Great pieces! The fish is so sweet! 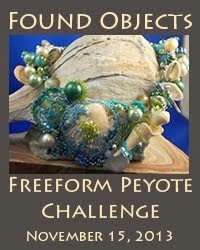 Beautiful design and beadwork! Karen I really like your Bluebird necklace. Your fish is cute and your steering wheel earrings are cool. You really created some wonderful pieces with your soup. While they're all just sublime, I can't resist the charm of that fish necklace. He's just too, too cute! 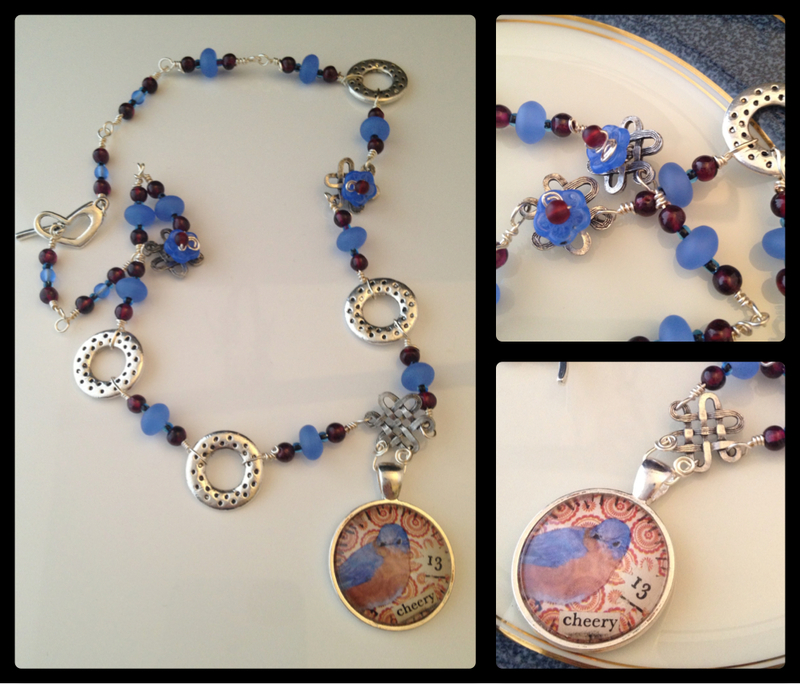 For someone that doesn't work with wire you sure hit it out of the ball park with your bluebird necklace. And your fish is so cute and whimsical. 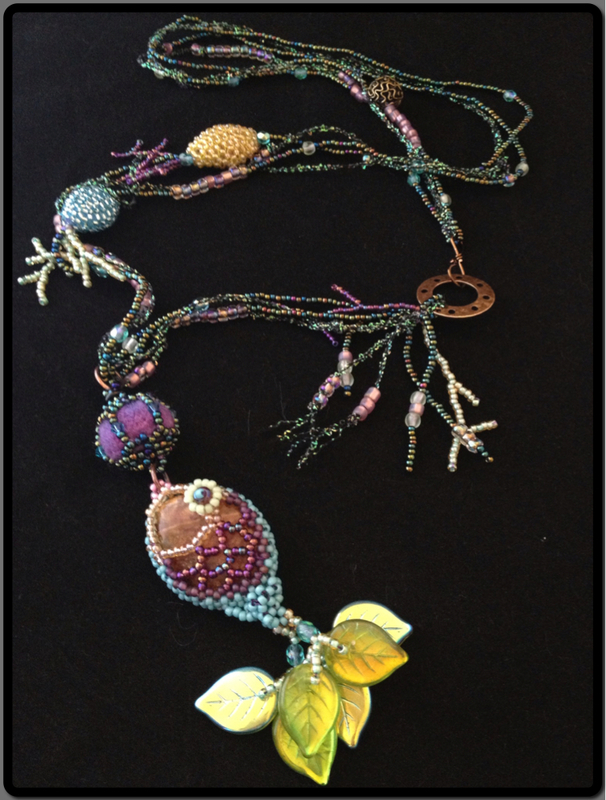 Love the "fishy" necklace, such dreamy colors, great work!